Ultra Marathon Running: GNW 2012 - 175kms of fun! GNW 2012 - 175kms of fun! As Ultramarathons go, for me there is no better atmosphere than that of the Great North Walk 100s. If has a certain folklore in Australian ultrarunning circles, and attracts some of the toughest competitors from across the country and overseas. The race briefing and pre-race banter is subdued as each of us has the occasional moment of clarity about the size of the task ahead of us. This feeling is the same if it’s your first time, or 4th time, although I must say for me this year I was in a far better place mentally than in previous years. 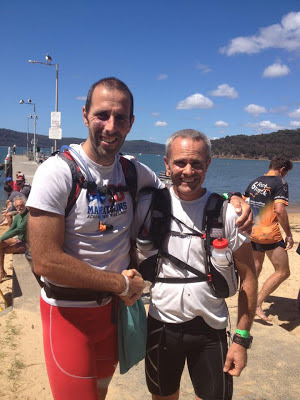 This event has a history of being stiflingly hot, and one where your heat management is the difference between running up the beach at Patonga and having a DNF against your name. It has about a 50% completion rate for both the 100km and 100mile events (actually 108 miles, 175kms) which is in part due to the severity of the terrain, and part the heat. This year though things were very different. I find the first few 100ms of an ultra the most amusing, as onlookers seem disappointed at the pace (or rather lack of pace) we show. It doesn’t take long to get into a rhythm, and I am determined to keep my pace in check, it’s a long way to go. I team up with a few running friends and we chat away the first 15kms. Notable mentions go to Rob Mattingly who declares it’s “my fault” that he’s there after encouraging him to join me on lunchtime runs when we worked together! I spend some time with Aussie ultrarunning royalty Jane Trumper, Kirrily Dear, Ron Stevens and chat briefly with Dave Graham, who I had met at the Glasshouse events a few weeks earlier. Little was I to realise that Dave and I would end up chatting quite a bit more over the coming day and a half. When the field is bunched up there are some great exchanges, especially as the adrenalin of the start is still pumping, and most runners sense of humour are still intact. There’s nothing like polite encouragement when you’re taking a nature break on the side of the trail! Crossing the road at Heaton Gap signifies the start of the first of the big climbs, and for a change I decide to run within myself, by not running at all and just engaging a steady plod up the steps and climbs until we get to the communications tower signifying the top of the hill. Sadly the low cloud, and showery rain put pay to any opportunity to enjoy the scenery, which was probably a good thing as it helped keep our minds on the job in hand, as well as keeping us cooler than normal. The field is still relatively condensed and I found myself in a group of 3 or 4 runners at any time. We’re just holding our place in the race order, and enjoying sharing running stories. I wasn’t so popular for reminding some of my fellow runners for upcoming hills, but I did make the point that I didn’t put them there and not knowing about them wasn’t going to make getting over them any easier! So it’s into Checkpoint 1 and I’ve very comfortable and relaxed. Jaci, my support crew, has an incredibly professional approach to her role, and she didn’t miss a thing. We agreed what fluids and fuel I’d need for the next section, and all the while I’m tucking into the homemade cakes, potatos, and fruit on offer at the checkpoint. Jaci’s efficiency made it easy for me to stay relaxed, which is so important especially with 150kms of running still to go. Leaving the checkpoint around the same time a group of 4 of us merge together, with Dave and Lise and another guy who’s name I didn’t get, but his story I’ll never forget. At the checkpoint he had applied some deep heat/dencorub to his thighs to help keep his legs warm. He had also taken to opportunity for some natural relief at the CP, and had forgotten to wipe his hands between the two actions. Needless to say he was “enjoying the warmth” and was recommending that we try it sometime. I accepted on the principle that he warm his hands first!! A few ks into the section our group splinters and Dave and I are left running together. We’re moving well and well within ourselves, and both of us are very conscious of keeping within these boundaries. 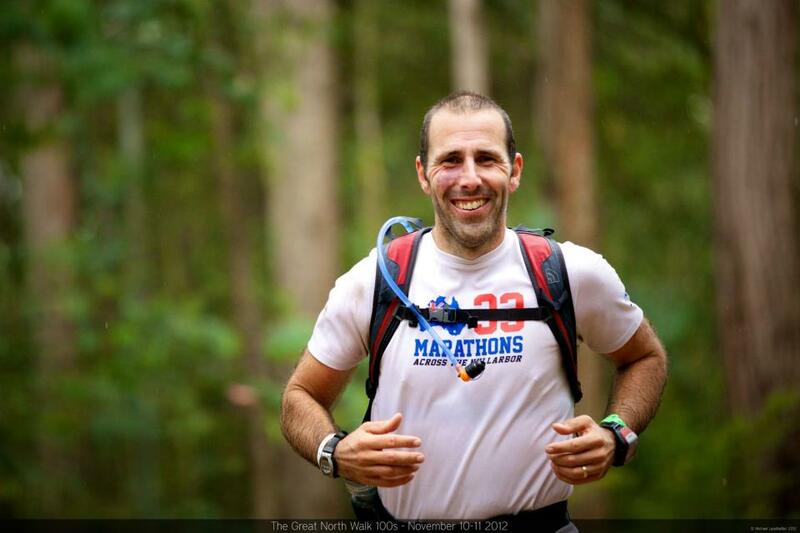 This was Dave’s first 100 miler, and he had a great approach, but the challenge was going to come later when the mental resolve would be challenged by tiredness, energy depletion, and sleep deprivation. As we dropped down towards Congewai road, we were in a convoy of about 7 runners. We chatted with Todd, Lise bolted off and we caught up with Rob again. The trot along the road was a pleasurable experience compared to previous years, about 10 degrees cooler. I was loving this section, talking non-stop (sorry guys) and running very much within myself. There was plenty of high fiving of those runners heading out of the CP on the out and back section, and it gave us a good appreciation of where we were in the field. I don’t know how I looked, but I certainly felt a whole lot better than some of those in front of us looked! Thanks to Jaci the CP transition was smooth and slick, kit checked, and even time for a chat with Darryl, before Dave and I headed off together down the road. There were more pained faces coming in the opposite direction, and I did my best to make them smile. I was and wasn’t looking forward to this section. I was because I wanted to get my own back on it for the pain inflicted in previous years, but wasn’t because I knew how punishing it can be. Rob caught up at the bottom of the first big climb and we shared some great conversation, which made it hurt a little less, and before we knew it we were at the communications tower. Rob decided to take stock here, and Dave and I pushed on. The next big climb seemed easier again, more mentally that physically, which I put down to having company, and company of a person who never complained or moaned about how hard it was. Dave is one tough character. I was looking forward to the unmanned water stop at the top for a refuel and a breather. I sat down on the log for about 2 minutes while refilling my drink bottles, and that was enough. Something happened that I thought was possible at GNW, I was cold, actually bloody freezing. My sweat soaked shirt and the cold wind was chilling. So there was only one solution...to keep moving. Since the Communications tower I’d been feeling a bit off, guts weren’t 100% and generally not feeling right. Normally this would last around an hour and things would stabilise, but not today. I still felt groggy getting into the Basin, but again the super crew had me turned around smoothly, even though we did steal a couple of minutes sit down. I wasn’t as enthusiastic leaving the Basin, as I still wasn’t right, but it was great to head out along the out and back section to see that we were still travelling well. Before we headed back up on the GNW turning was passed Jane and Kirrily, looking great, smiling, and who were well ahead of their schedule. I’d travelled up with Jane the day before and had a good idea of her plans, so this was great to see. Dave and I caught up with Mallani next and we were all glad to use our combined navigational skills to keep us on the right track. I was still feeling pretty flat, when we were greeted at the track junction but Dave Byrnes. He commented on how well we looked and that we were travelling well. I thought to myself that it’s been a long day for Dave too. He probably was as deluded as we were by this stage! Meeting up with Dave Byrnes on the course I find an uplifting experience. So with that a two salt tablets, I start feeling normal again. It’s been about 4 hours since I felt like this, so I just put my head down for a bit and find my rhythm, there was a time when I considering how unpleasant the rest of the run would be if I didn’t get out of this low. Rationally I think it was mainly an electrolyte imbalance, but I think there is a bit of magic in being spurred on by the race director as darkness fell. We stopped chat with Daryl as we hit the road, somewhat disappointed that we didn’t see any fireflies as I had done at this point in previous years. The fact of the matter was, it was too light for them, and previously I’d been 2-3 hours further back! The road section passed quickly, plenty of chat of future racing plans were the main topic of conversation. We both appreciated the ease with which you can run on road compared to the trails, and were happy with the change. Into Yarramalong in 14:52, 103k’s down. We would have been happy with that as a 100km race time, and I noted that it was over an hour faster than my first 100k, for far less effort. Rachel Waugh came in just behind us and she was pulling out. We tried to talk her out of it, but she’s experienced enough to know when to stop and when to keep going. We both had a good refuel here. 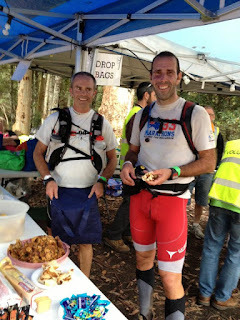 Fresh Drymax socks, fresh shirt, a load of soup and noodles, we left the checkpoint feeling really good. It’s amazing how a change of clothing can make you feel some much different. The Ay-Ups was doing the business, making it seem like we’re running in daylight. The runners in front would know we were coming for sure. This is never an easy section, but Dave and I had a solid strategy, run the flats and the downs and power walk the hills. We caught another runner on the way to Dead Horse Creek, he had gone about 200m past the turn (off the road) so we saved him any more back tracking. The track through this section was challenging, as numerous trees had fallen across the path, making it look as though you had hit a dead end. Thankfully Dave’s GPS had the course loaded into it, so we knew we were still “on the right track”. 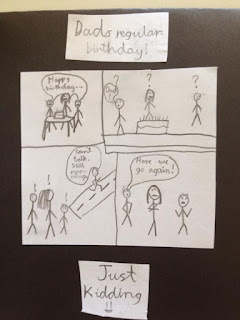 At about 20 past midnight I remembered what day it was and said a little happy birthday to myself, thinking what a way to spend your birthday. Most people would go to a nice restaurant, or have a relaxing day on the beach! We caught up with Lise again on the road section, and it wasn’t until was got back on the hills that we opened up any distance. I later learnt that she was injured, but with her bubbly persona, you’d never know it. Somersby, and it was still dark, another novel experience! Fresh shoes, socks and shirt this time, the Hoka Mafates were great, and I only changed them because they were getting a little heavy with all the sweat I was pumping into them. More soup, and a coffee and we were off again. Leaving here I feel like we’re already on the beach. The next section is short and mainly downhill, and then you’ve only got the last section to go, so if you start it, you’ll more than likely finish it (although there are many cases of people who haven’t). There is some nice easy sand running, and before long we’re passing a group of four who look to be in a bad way. Andy Dubois was using a stick to help himself along. Obviously suffering, but cheerful enough to blame himself for lack of the right preparation. We were engaging our aggressive walking strategy along much of this section, and it gave me the time to do a few quick calculations. If we could get into Mooney Mooney in the next hour, we’d have about 6 hours for the last section to go sub 30 hours. With this in mind we pushed on, and made sure that we had a quick turnaround at the checkpoint. I had an unusual experience at the CP. When weighed, I’d actually put on a kilo since the previous weighing (still 2kgs down on my start) which is an achievement I’m quite proud of! The cooler evening, good fuelling and smart running had enabled me to keep hydrated. Jaci was ready to pace us for the final section, and she was clearly up for the task! I’d never had a pacer before and was lucky to have someone who had taken the role so seriously. She had been out on the course, learning the route, and it was great not to have to think about navigation this late in the day. We did have to pull her back a bit early on, as we weren’t quite as nimble as we may have been with 150+kms in our legs. She knew we were well inside that 30hour time, and was keen to get us home in under 28, even mentioning 27 at one point. The 28 would certainly have been achievable up until about 15kms from home. On the steep sets of stairs where you have to lift your foot above your knee height I strained my right calf. I don’t recall it actually happening, but the leaping down and climbing up the steep rock steps was aggravating it with each step. So about 10kms out I’m reduced to a walk. I’m processing the time and distance calculations as it was looking like all the hard work would be undone. This isn’t helped by being on what feels like a never ending fire trail, and the sensation that we’re running in the wrong direction for where the finish feels it should be! Jaci is reassuring and takes advantage of my situation for a few photos, trying to capture me at less than my best! It was also getting hot now, and much more like the GNW we are familiar with. Still we plod on. Dave and I had been about 20 m apart, for most of this leg, and it was really to enable us to focus on our own forward progress. About 6 kms to go and I’m still not convinced, although Jaci says we have well over 2 hours to go sub 30! 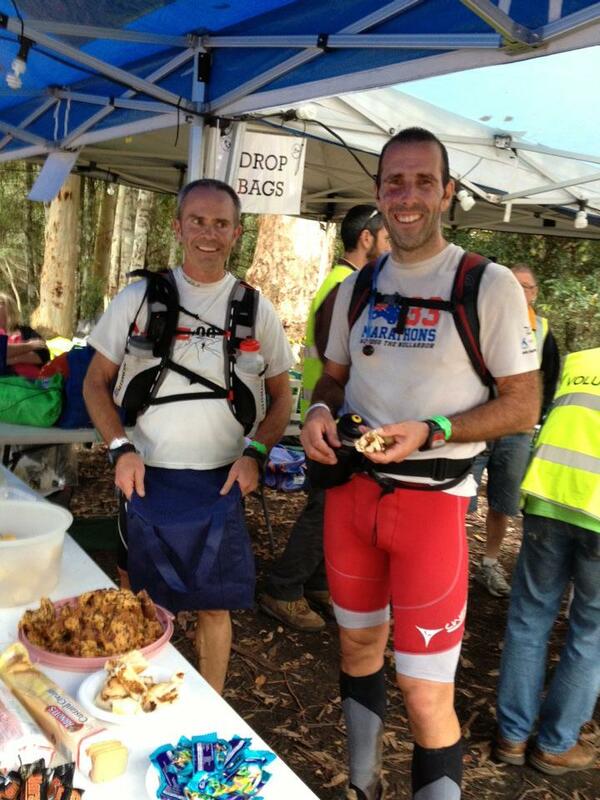 We were passed by Mark Redding and Martin Price in this last section and they both looked to be travelling strongly. These were actually the first people to pass us running since we dropped down on to Congewai Road at about 50kms. The steady early pace had really paid off, and without the injury I believe we would have maintained that to the end. At last we can see the beach, and we’re on the single track that leads to the sand. My calf wasn’t enjoying this downhill section, so Jaci fashioned me a walking stick to deal with the steps. Approaching the sand Dave’s talking about running up the beach, running! I wasn’t so sure, but with the smell of the fish and chip shop in the air and the ringing of the bell, it’s amazing what resources you can draw on. We assault the beach together and get drawn in by the magnetism of the famous GNW finsh post. Dave and I had completed the distance in 28:48. 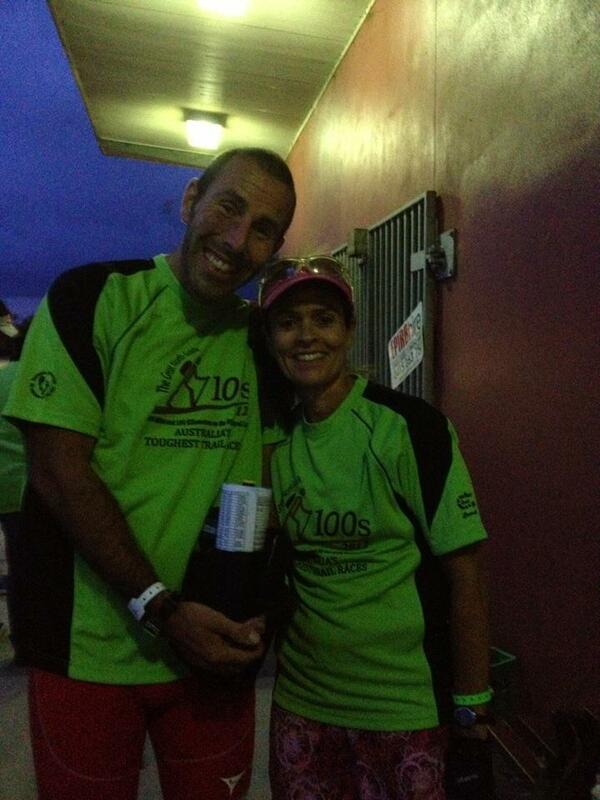 A 4 hour pb for me, and an incredible maiden 100miler for Dave. I feel so privileged to have found such a great running companion for the day, and to share in what is always a special event. Congratulations Dave that was an inspiring performance. The rest of the day was as enjoyable as the running scene gets for me. I had a snooze for about an hour in the medical tent (after taking about 10 minutes to hobble across the road!) and then hung around the finish post watching all the other amazing athletes complete something special. I obviously didn’t look too good as Paul Every gave me his seat on the basis that he thought I needed it. I hardly moved from that seat for the next few hours. It was great to be in the company of such a great group of people, all celebrities of the ultra running world. So thanks Paul, Di, Blue Dog, Jane, Kieron, Joe, Daryl, and everyone else for making the afternoon so enjoyable. 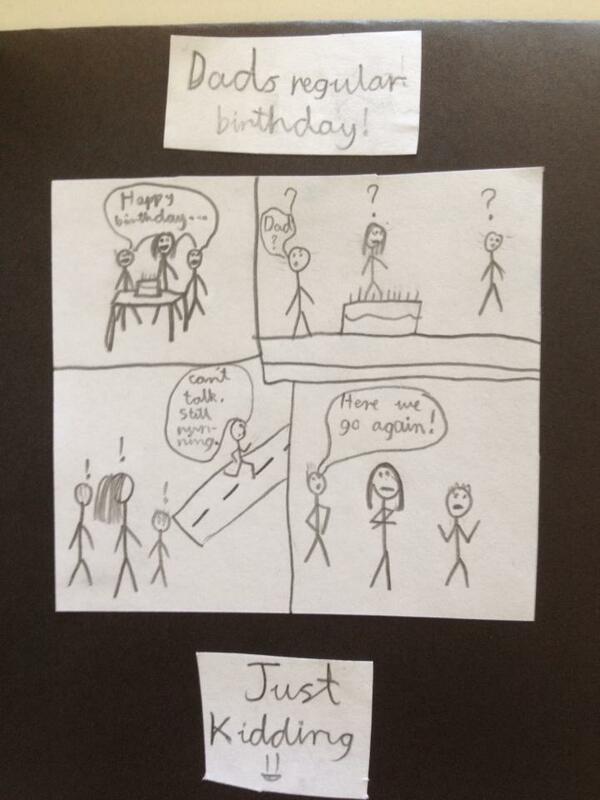 My birthday card from Jack! So at last a few other thanks, Dave for putting up with me for a day and a half and pulling us through those tough hours, Jaci for exceptional crewing and pacing, Dean for lending me Jaci for the weekend when I know she was needed elsewhere and by no means least Angie and my boys Jack and Harry who once again have had to put up with me being away for my birthday! I think it was all worth it. Inspiring as always! Well done on both the run and the wire up! Well done on a great run and Happy Birthday! I love that card! :) Looks like a really awesome event. Thanks Guys, it was a great day out, one I was keen to share. Great report Andy - it sure was 175km of fun. See you at the next one for another Hoka One One conga line! My report's on coolrunning if your interested.